05.23.2007 - Oppossums can hang from their tails. In fact, their tails are prehensile, which means that they can curl their tails and grip objects. They primarily use this feature to aid in climbing and balancing in trees. The truth is that they rarely actually hang from their tails. There's really no need for it. However, they can do it if they must, perhaps to catch themselves from a fall. 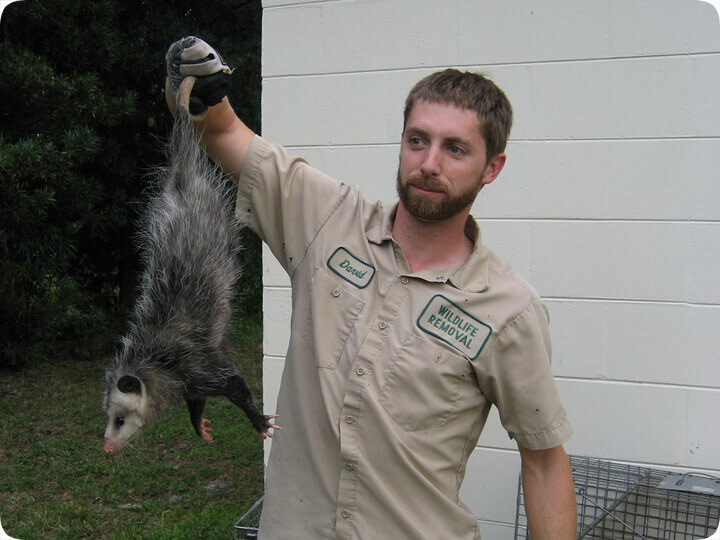 Thus, I am able to hold an oppossum by the tail with no harm to the animal. This creature is fairly docile. I've seen very few aggressive ones. It's pretty safe to handle them this way. However, I wouldn't want to hold one by any other part of the body, for fear of a defensive bite. In a pinch, I am able to catch oppossums by the tail. This usually only occurs when the animal is inside a house and accessible. I'm aware that I've misspelled the name of the animal in this blog post, but there's so many common misspellings of this animal's name that I figured I'd give it a go this time. Opossum, possum, oppossum, oposum, opposom, apossum, etc. The oppossum, (Didelphis virginiana) is a nocturnal animal that lives in North America. It is a marsupial, which means that the females give birth to tiny young, who grow in a pouch. These young eventually cling to the mother's back and drop off when they are large enough. Oppossums are unique for many reasons. They have opposable thumbs, prehensile tails, 50 teeth, and several other unusual features. They are omnivores who eat almost anything, they have excellent immune systems, and they rarely live more than 2-3 years in the wild. They are most commonly considered a nuisance species when they live in an attic or other structure, such as under a shed, or steal pet food or threaten animals.